2018 marks the 200th anniversary of steam on the upper Great Lakes (and the 201st anniversary for the Lakes as a whole). 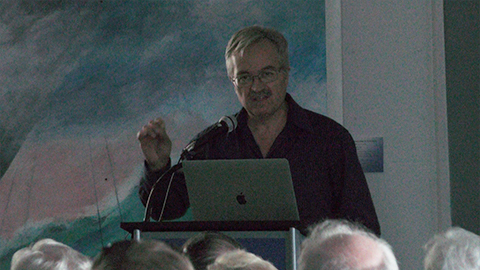 His presentation explored the early story of steam around the Lakes and the particular challenges of bringing new technology to the edge of pioneer settlement and beyond. The story was populated by gentlemen and scoundrels, celebrations, breakdowns, shipwrecks and near misses and illustrated by a wide range of contemporary and modern artists. The Annual Lecture Series was sponsored by the University of Toledo and held at The National Museum of the Great Lakes.